Brasilia’s infrastructure and main civic buildings were built in the late 1950s, and the city was inaugurated as the capital in April 1960. Two years earlier, the British government, with deep misgivings because the enormous Rio de Janeiro residence had only been in use for eight years, selected in Brasilia a 2.75 hectare freehold site for its future embassy offices and residence at Plot Number 8, Avenida das Nações, close to the lake and next to the Australians. This site was granted by deed of gift in 1960. Residential accommodation for the 30 or so UK staff likely to move to Brasilia was expected to be leased in the market. In 1959, the Foreign Office and the Ministry of Works began drawing up schedules of what accommodation would be required. By then, the development of Brasilia was creating a lot of excitement around the architectural world, as the Brazilians talked up their hopes for the future diplomatic buildings to represent each country’s past, its contemporary tendencies, and how it saw its future. 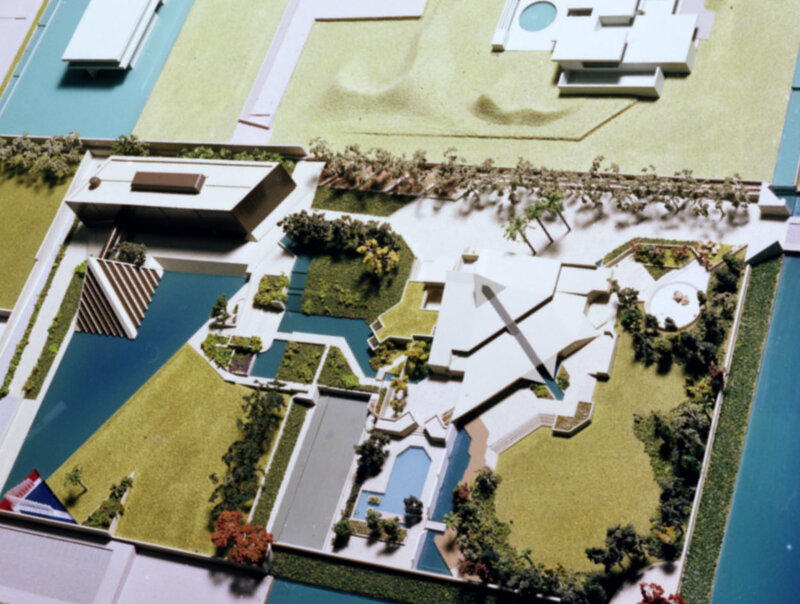 Sir William Holford, who had been a member of the competition jury for the Brasilia pilot plan, told Sir Edward Muir, Permanent Secretary at the Ministry of Works, that both Costa and Niemeyer hoped that the range of new embassy buildings overlooking the lake would be ‘the best of their kind in the world’ and designed by the ‘most interesting architects’ in their respective countries. The ensuing eight year saga of an indecisive client, self-willed architects, and a misconceived design is described in Room for Diplomacy pp.352-360. The delay in fact caused little harm because the Brazilian Ministry of Foreign Affairs was equally behind with its own plans to move from Rio to Brasilia. Robert Mellish, the Minister of Works, signed the termination letter to the architects, Peter and Alison Smithson, in April 1968 and told the House of Commons in June that there would be a two-year deferment of the Brasilia embassy project and that the decision about future architects for it would be taken later. 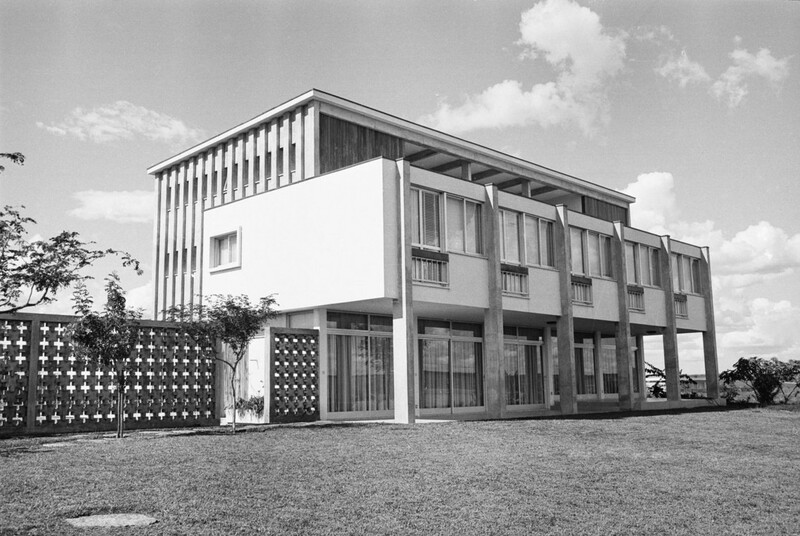 Although the permanent offices and residence could wait, the embassy in Rio had needed some presence in Brasilia throughout the 1960s. 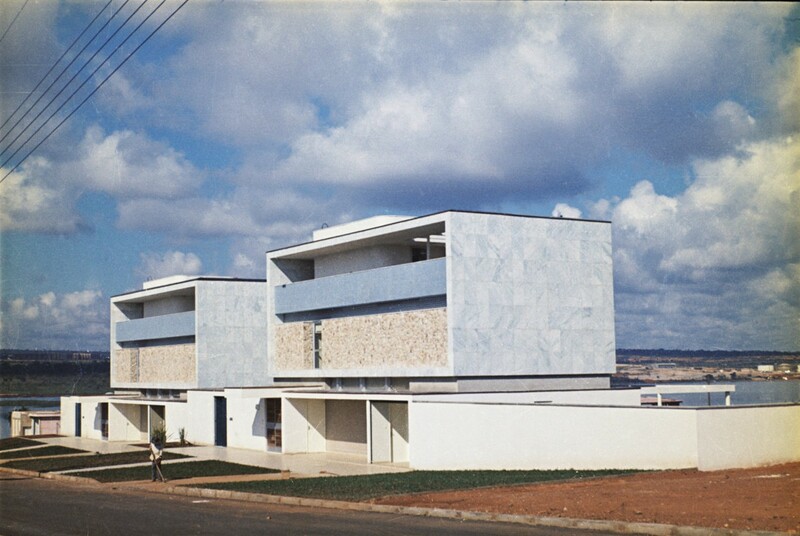 To this end, the ministry had, in parallel with the Smithson saga, been managing a subsidiary programme of site acquisition and building construction to ensure the availability of office and staff residential accommodation in step with the gradual increase of staff as they moved from Rio de Janeiro to Brasilia. The first requirement was for temporary offices on the allocated offices/residence freehold site on Avenida das Nações. Called the staging building, this was designed in-house by the ministry and completed in 1961 for £30,000: it was later extended and modified. – the fifth of these sites was later part-exchanged for Lot 14, Sector QL 8/5, where an amenity swimming pool was built in the mid-1970s. For a temporary residence, Lot 2 in Sector QL 4/12 South Peninsula was bought in 1966 and a house built on it in 1967. An adjoining site was bought in 1972 to upgrade and enlarge the residence once it had become clear that a permanent residence was still quite a few years off. 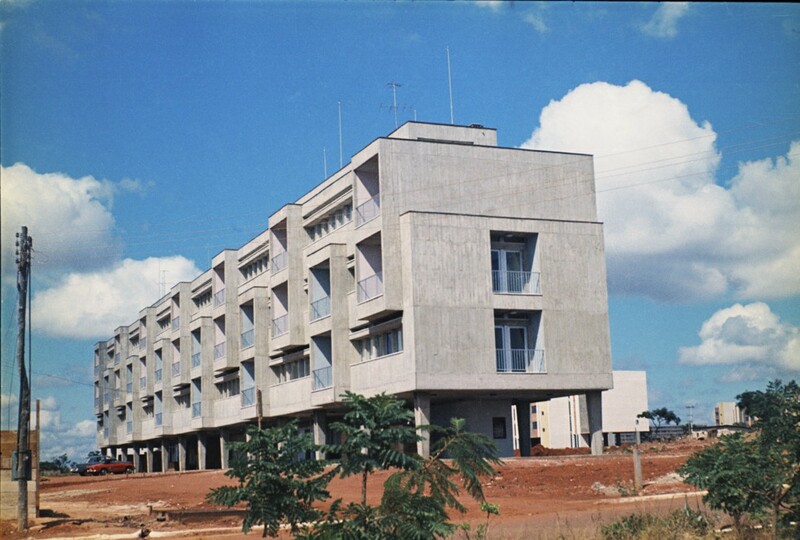 The embassy moved to Brasilia early in 1972, and was able to occupy a freehold estate that by then comprised, besides temporary offices and residence, twenty-seven staff units. This accommodation had been provided in a low profile and efficient manner, but it had serious drawbacks. The buildings were barely satisfactory in themselves; the staff flats block was particularly disliked (mainly because of tight dimensions imposed by NOVACAP); and the North Peninsula took far longer to attract residents than expected (and than the South Peninsula) so that relative isolation was a problem for some families. Over the years, some of the houses were sold, several undeveloped Lots disposed of, and the 18-flats block internally reconfigured to 12 flats. By 1974, permanent offices and a permanent residence on the main Avenida das Nações site had become high priorities. The PSA decided, with the FCO’s acquiescence, that both should be designed in-house and it appointed Alfred Coutts, a superintending architect in DEMOS (Directorate of Estate management Overseas), to lead a design team dedicated to this project. It began work in 1974, construction started on site started in 1980 and the buildings were occupied during 1983. 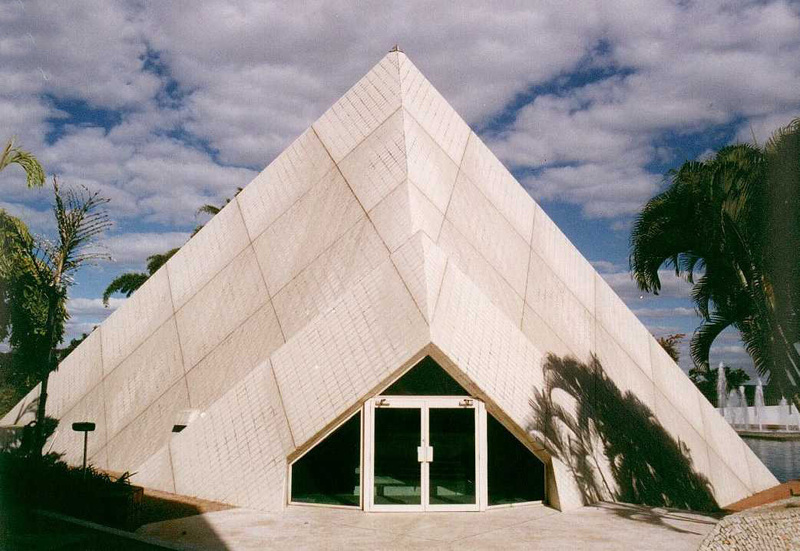 They comprised a three-storey, fully air-conditioned offices block of about 2,500 square metres; a free-standing two-storey pyramid-shaped exhibition and function pavilion; an unusual residence of two floors beneath a large roof that reached down in places to the ground; and a range of ancillary buildings. A three-metre tall bronze sculpture, Richmond Oak by Kenneth Armitage, was commissioned in 1984 by the Government Art Collection and placed in front of the offices, by the swimming pool. Copyright of the Smithson’s axonometric drawing above belongs to The Frances Loeb Library, Harvard Graduate School of Design. 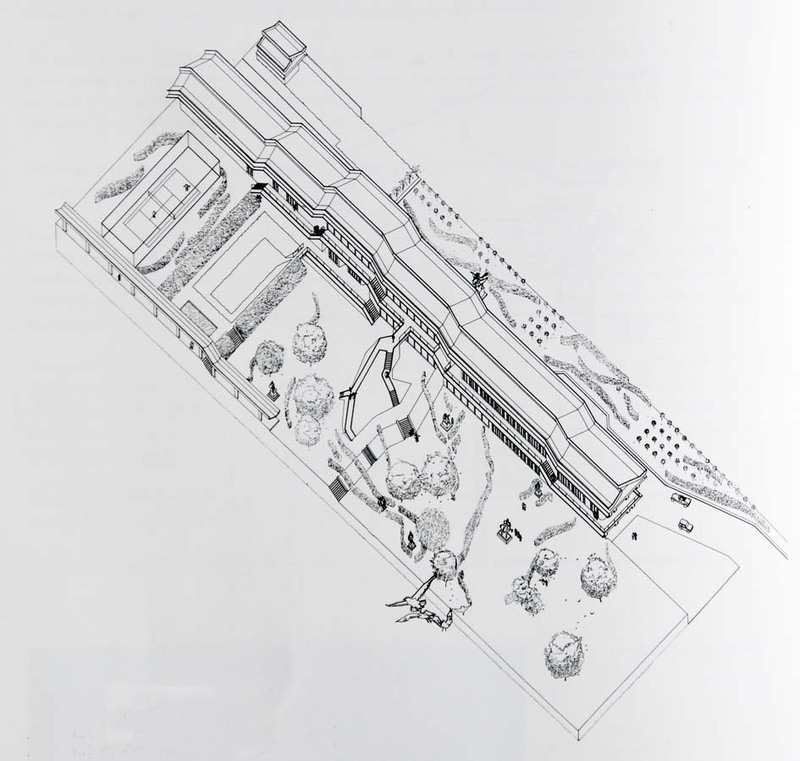 Axonometric drawing of the Smithson’s proposal, 1965. This scheme was abandoned in 1968. Entrance frontage of two First secretary houses in North Peninsula, completed in 1968. Block of 18 staff flats for UK-based staff, completed in 1968. Counsellor’s house on South Peninsula, completed 1969. Early model of PSA’s compound proposals, 1975. 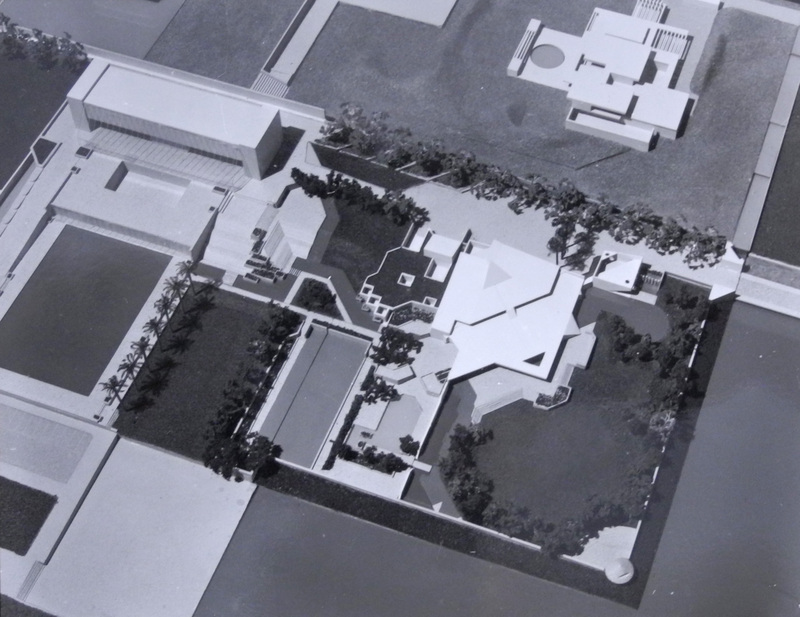 Bird’s eye view of final model of PSA’s compound layout, 1977.